Sustainability is on the agenda of every nation, every organisation, and many citizens today; it is a global movement that cannot be ignored. If we do nothing, unsustainable global trends will impact businesses over the next twenty years, as well as governments and civil society organisations. These trends range from climate change to ecosystem decline, from energy insecurity to water scarcity. They affect resource management, poverty, economic justice, food security, demographic change, population growth, and more. Those who are confronted with sustainability challenges notice another global trend: solutions cannot be found in isolation. Collaboration among different actors is paramount; it is also the sole route to successfully addressing the challenges we face. The Club of Rome is an organisation of individuals who share a common concern for the future of humanity and strive to make a difference. The members are notable scientists, economists, businessmen, high-level civil servants, and former heads of state from around the world. Their efforts are supported by the Secretariat in Winterthur, Switzerland, the European Research Centre, registered in Constance, Germany, and National Associations in more than 30 countries. The Club of Rome conducts research and hosts debates, conferences, lectures, high-level meetings, and events. The Club also publishes a limited number of peer-reviewed “Reports to the Club of Rome”, the most famous of which is “The Limits to Growth“. The Club of Rome’s mission is to promote understanding of the global challenges facing humanity and to propose solutions through scientific analysis, communication, and advocacy. Recognising the interconnectedness of today’s global challenges, the Club of Rome’s distinct perspective is holistic, systemic, and long-term. As a full member of the Club of Rome, Dr. Petra Kuenkel, with her wide range of professional background, belongs to this global movement network. Leading for Well-Being invites people to work together and catalyse a better economy. Leading for Well-Being’s mission is to drive change in the world’s major institutions, especially business, so they operate in service of well-being for all. This will reliably increase human health and productivity and foster sustainability. It will give change agents a vision of the future we want, who we are as humans, and how to implement well-being at work and in society. It will shift businesses to be part of the solution, not a cause of a problem. 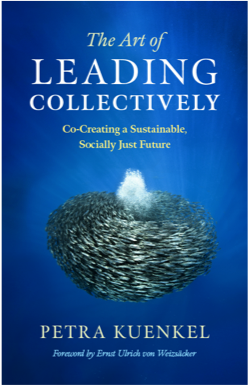 Volume 2 of our Collective Leadership Studies explores the conceptual background and application of CLI's core methodological approach, the Collective Leadership Compass, which empowers individuals and groups of leaders to navigate complex change in multi-stakeholder collaboration. The UN Global Compact is the world’s largest corporate sustainability initiative. It is a call to companies to align strategies and operations with universal principles on human rights, labour, environment and anti-corruption, and take actions that advance societal goals. CLI has a partnership with some national UN Global Compact chapters to build capacity among corporate participants in stakeholder collaboration and collective leadership.